I’m not only saying that the Christmas season has arrived, but also that The Queen Victoria is THE place to experience it. A stay at The Queen Victoria, either before, during, or slightly after Christmas (through Jan. 3rd), is the best possible way to experience the cheer & joy of the season. In this edition of our newsletter, I’ll treat you to a little more Christmas content, but we are always looking ahead here (because you’re always planning ahead), so I’ll also be tempting you with lots of great reasons to visit The Queen Victoria in the coming months. Now that “Black Friday” has come and gone it is time to get serious about finding the perfect gift for your loved one. First of all, let’s all agree that you won’t find it at the Mall. Amazon doesn’t carry the perfect gift either. No, there is only one place to get that perfect gift, and that is The Queen Victoria. Conveniently, you need not physically stop here to purchase it (though that is always a fun option), as it can easily be purchased on the internet or with a phone call. I’m suggesting a GIFT CERTIFICATE to The Queen Victoria, of course! The lucky recipient of your generosity is sure to love your gift to them. Who wouldn’t love the gift of Cape May in general and The Queen Victoria in particular? You don’t have to worry if it will fit or if it is the right color. It is sure to still be in style, and you don’t have to worry that the technology of your gift will be outdated before the package is unwrapped. It doesn’t require assembly or batteries. It is easy to hide until Christmas morning (or Eve, depending on how your celebration works). If you’re giving it to your loved one, you’ll enjoy using it as much as they will. Best of all … a gift certificate to The Queen Victoria is EASY to purchase. You can even do it online and have it emailed to you instantly. If you’re a procrastinator, which I don’t recommend, you don’t have to worry about us running out of them. You can wait until Christmas Day and still purchase one to present that day. We have an unlimited quantity. 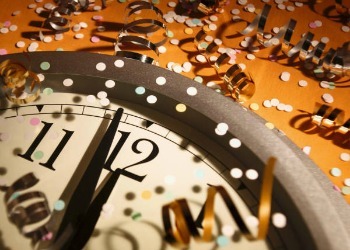 As I write this we have just 3 rooms left for New Year’s Eve. That means you still have a chance for a New Year’s visit to The Queen Victoria, but you need to act quickly. Remember, about 15,000 other people are getting this email too, so you really don’t want to delay. If you’re undecided and are looking for a comfortable, festive, cheerful and relaxing place to celebrate Christmas, then The Queen Victoria just might be the perfect place for you. We’ll have 15 to 20 couples joining us this Christmas for a special holiday experience. There is nothing quite like waking up on Christmas morning at The Queen Victoria, following your nose to a sumptuous breakfast past all of our festive Christmas decorations, and enjoying the company of our cheerful guests. Beyond the good cheer and wonderful Christmas decor there are lots of other reasons to spend Christmas at The Queen Victoria. On Christmas Eve we’ll be hosting a special holiday reception (instead of afternoon tea). Santa always makes a nocturnal visit to The Queen Victoria too, so there will be a special Christmas surprise waiting for you in the morning. On November 15, 2014 we were pleased to welcome Medium Debbie Wojciechowski to The Queen Victoria for her first channeling event in Cape May. All I can say is WOW! Everybody who participated was blown away with the experience. Debbie is definitely the “real deal”. Call today to reserve your seats! Like many of our 2015 Winter events, our Wine Blending Party is nearly sold out. We have space for only 3 more couples. The Big Cheesey is definitely one of our most popular events , and no wonder! How can you beat an event featuring 16 different types of artisanal cheeses, tastefully laid out on The Queen Victoria dining room table, which is also laden with breads, crackers and fruit? What’s more, it is a free event. I’m serious! You can spend an entire afternoon sampling some of the finest cheeses from around the world and it won’t cost a cent. One of the most enjoyable aspects of The Big Cheesey, besides the great cheese and good company, is the BYOB nature of the event. Almost everybody brings a bottle of their favorite wine to share with everybody else, so it turns into a wine tasting event too. This really is a wonderful event. Be warned, though. Most guests who attend a Big Cheesey get hooked on it and become regulars at the event. Only registered guests can attend, of course. This March we will be hosting our 3rd annual Whiskey Challenge in honor of St. Patrick’s Day. Some places have parades, we have more fun than that! This event started out in 2012 as an “Irish Whiskey” challenge. It turns out there are more Scotch & Bourbon drinkers than Irish Whiskey drinkers, so last year we opened it up to all types of Whiskey. So you’re asking yourself, “but what is it all about?”. Thanks for asking! This is a BYOB event, in which every participant brings a bottle of their favorite whiskey. I take them into the kitchen and pour some of each into a numbered decanter and bring them back out for a blind tasting in the Prince Albert dining room. Everybody in attendance sips and tastes their way through the offerings, trying to select their favorite. We even have scoring sheets prepared for those who want to really take it seriously. At the end of the afternoon we cast our votes for our favorite. Wouldn’t you love it if your favorite beverage was picked as the best? I’m talking about serious bragging rights. The Challenge is a low key, and surprisingly sober event perfectly suited for a quiet March weekend. Last year it really came into it’s own, featuring some incredibly good Irish Specialties (Irish Stew, Bubble & Squeek Cakes, etc) to go along with the Whiskey we were all sipping and tasting. We’ll be serving up some great food again this year too! At the end of the event I’ll pour the remaining decanted whiskey back into each bottle and return everybody’s bottle to them. Don’t worry, we’re sipping here, not doing shots, so you’ll have something to take back home with you. Buckingham is a great room. It is quiet, private, bright, charming, and has a very large bathroom with a wonderful 2 person/2 head shower, located on the 3rd floor of The Queen Victoria building. The thing I love most about Buckingham is the character that the Mansard roof line gives the walls. Their sloping nature creates deep window wells, giving the room some texture. One of those windows (the one on the right of this picture) also has a glimpse of the ocean, especially during the winter when the trees are barren. With windows on 3 sides of the room, it is also one of those rooms where you can open up the windows and enjoy the our wonderful ocean breezes (I suggest waiting until Spring to try that, though). 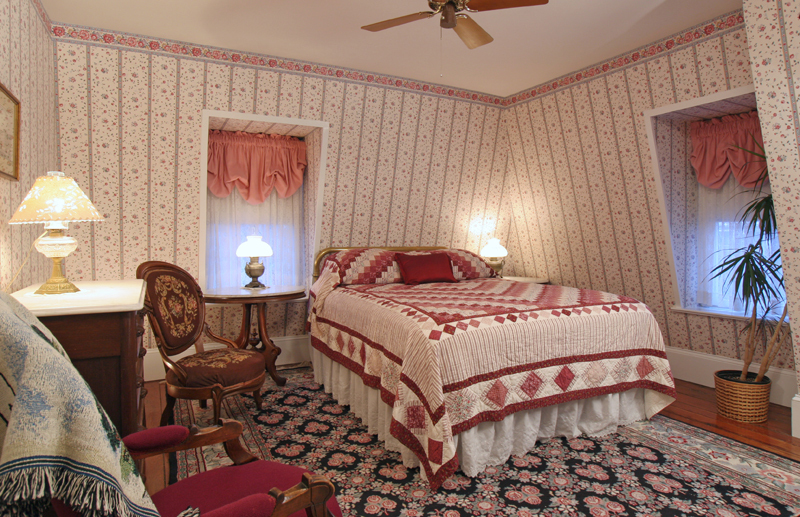 Buckingham is a large standard class room, which means it falls toward the bottom of our rate chart. That’s good news for those extended stays! If you are able to travel mid-week (Sunday through Thursday) you can take advantage of our “222” package, which runs now through the end of April, 2015. Talk about affordable, this package offers 2 nights for $222 for a standard room. Upgrades to larger rooms are possible at similar savings. This package is not available during the Dec 24 through Jan 1 holiday week. Starting January 4, 2015 we’ll once again be offering our ever popular Winter Escape package. The Winter Escape is ANY 2 nights (including weekends) in a Large Standard room for $325. This package runs through March 31, 2015. Upgrades to Premium rooms and suites are also possible at similar savings. This package is not available during the Feb 13-15 President’s Day holiday weekend. Be sure to call us at (609) 884-8702 if you wish to take advantage of these great specials. Bookings for discount packages cannot be made online! Note: 3rd party gift certificates (like bedandbreakfast.com) are not accepted for discounted package reservations. 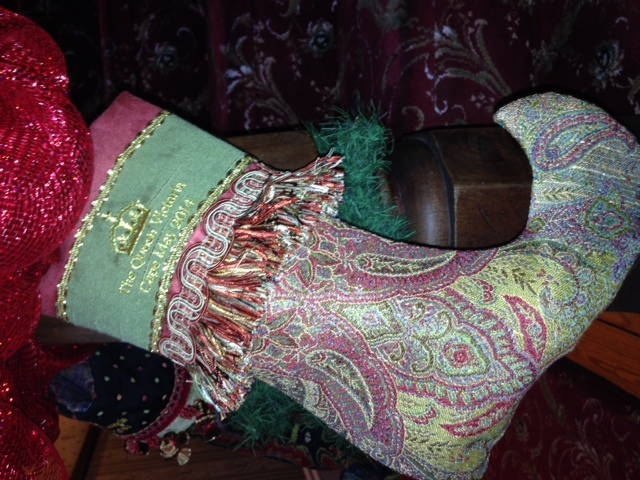 Every year we commission a new, custom designed Queen Victoria Christmas Stocking. Many of the stockings we get each year are for the guests who spend Christmas with us at The Queen Victoria. We always order extras, however, for sale in our gift shop. This year’s stocking is truly magnificent, as you can see. It is like nothing you’ll find anywhere else. We are very proud to tell you that they are designed and hand crafted in the U.S.A. The workmanship is exquisite. Have you ever been to Sunset Beach? I know that our guests are often treated to magnificent sunsets there, but it is hard to imagine too many as incredible as this one was. This was a “Drop everything and experience the moment” life event. It just doesn’t get much better. 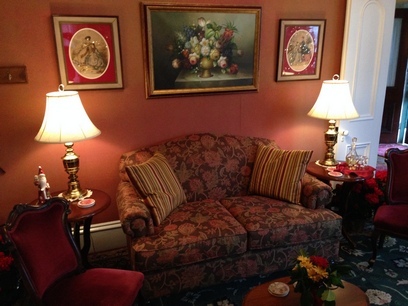 This beautiful, comfortable sofa arrived at The Queen Victoria a couple of weeks ago. It has been getting rave reviews ever since. This new sofa (and the departure of the player piano it replaced) has given the parlor of The Queen Victoria building a wonderful, warm, and cozy feeling. Can’t you just picture yourself sipping your afternoon tea on the sofa, gazing into the fireplace on a winter afternoon? What better way to get into the spirit of Christmas than a musical review of Christmas songs & carols? This year Cape May Stage is presenting a brand new musical review featuring the amazingly talented Claire Neumann singing all of your favorite seasonal songs. Anna Marie and I had the pleasure of attending one of the first presentations of this wonderful production, and we really enjoyed it. It was lighthearted, funny, and we got to sing along to a few traditional favorites. 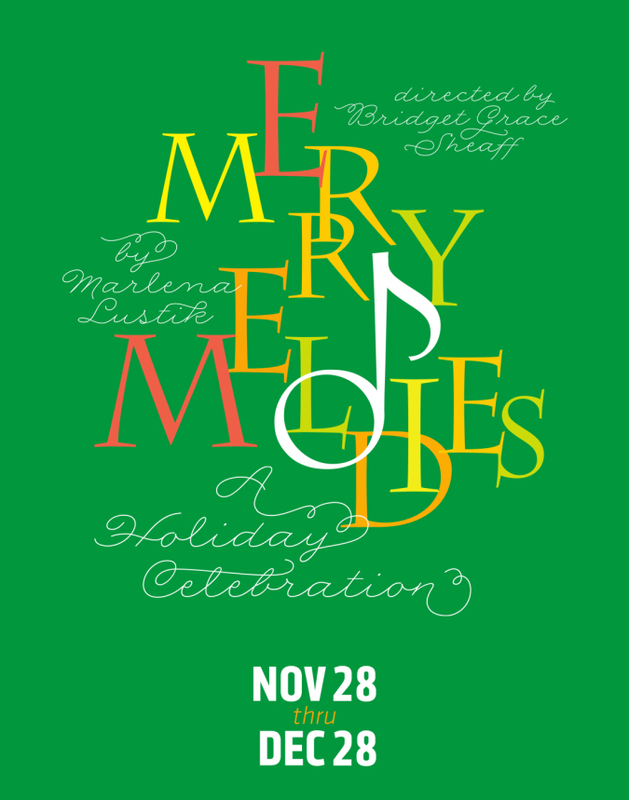 You should definitely include a night out at Cape May Stage’s “Merry Melodies” during your upcoming December visit to The Queen Victoria. For many of you, a trip through the Cape May Designer Show House has become a staple of your visit to Cape May. Many of our summer visitors were disappointed that there was no Designer Show House open to see this year. In fact, there IS a Designer Show House for 2014, but it is on a different schedule. 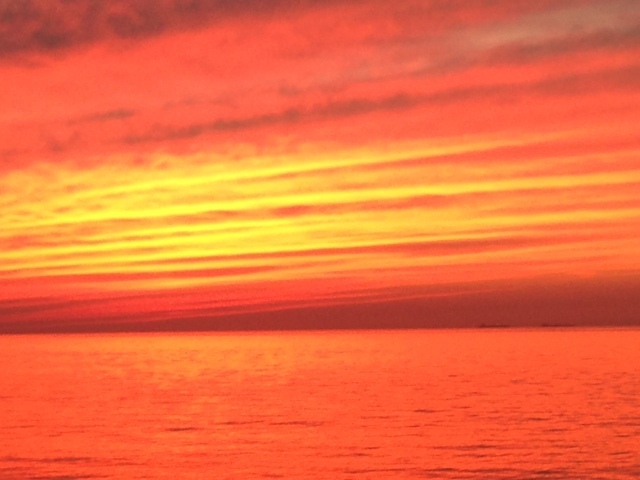 That is good news for our guests visiting Cape May during our “shoulder” seasons. 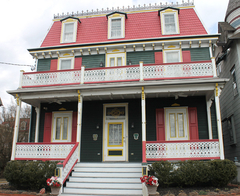 The Designer Show House, located 2 doors down the street from The Queen Victoria, opened this year in October and will be open until Memorial Day weekend of 2015. Lots of our recent guests have been making the trek across the street to enjoy this year’s show house, which really is magnificent. 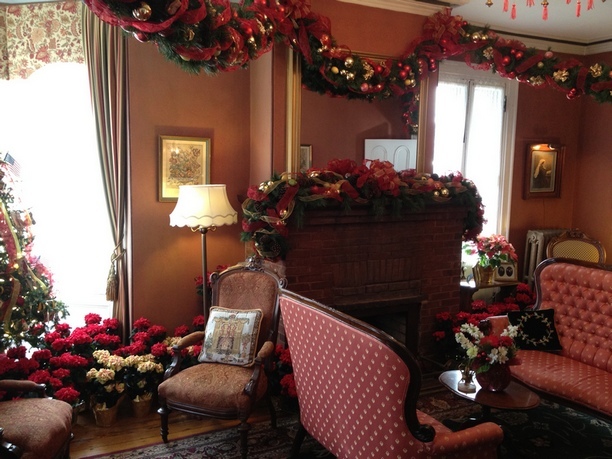 During the Christmas season you can purchase a combination tour that includes both the Designer Show House and a tour of the “Cherry House”, which is certainly the most beautifully decorated private home in Cape May (It is also one of the most charming homes in Cape May). I highly recommend the combination version for those of you visiting in the next month or so. Anna Marie and I had a wonderful meal at the Mad Batter the other night, and I could hardly wait to tell you about it. First of all, we went there on a Tuesday night, so we were able to take advantage of their “Buy one, Get one” special, offered Sunday through Thursday nights. 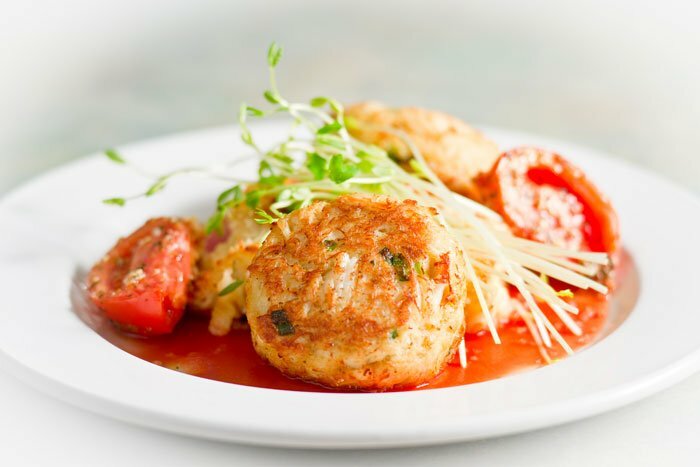 All you need to do is order either one appetizer/salad or a dessert for a party of 2. Easy! We decided to split a salad, which they plated separately for us, and I believe we ended up with 2 full sized salads. Anna Marie ordered the Twin Filet entree, while I had the Crab Cakes. Both were amazing. We shared our meals with each other, enjoying a “steak & cake” dinner. Anna Marie’ mom & dad joined us that evening for dinner and they both loved the Salmon entree. All through the meal Anna Marie and I were commenting on how much we were enjoying our dining experience. The food was wonderful, the dining room very comfortable, and there was live music being performed in the bar, which was audible in the dining room (but not too loud). We both agreed the next day that it was one of our best meals out of the year! As you must surely know by now, we favor BYOB restaurants, which keeps us from frequenting the Mad Batter much, but I must say they price their wines reasonably, allowing you to enjoy a nice bottle of wine without breaking the bank. The discount on the meal more than made up for the additional wine cost we incurred. I believe that they will be offering this special weeknight deal through December 23. If you’re planning a visit to The Queen Victoria this December, especially if you’ll be here mid-week, I highly recommend a dinner at The Mad Batter.